A throwback “BAKERY” sign hangs from the exterior of a hole-in-the wall bakery better known as BabyCakes. Once you approach it, you’re certain to be charmed. If you know anyone with food allergies, BabyCakes is the place to send them. A vegan bakery, they serve up gluten-free, dairy-free, egg-free, soy-free, vegan sugar/agave-sweetened confections that are quite delectable–even for the non-allergic. I have been to BabyCakes many times. In fact, it’s one of my favorite bakeries, and I don’t even have a food allergy or autoimmune disease. Today, My Dining Partner (MDP) and I opted for a few delectables from BabyCakes’ well-rounded menu. 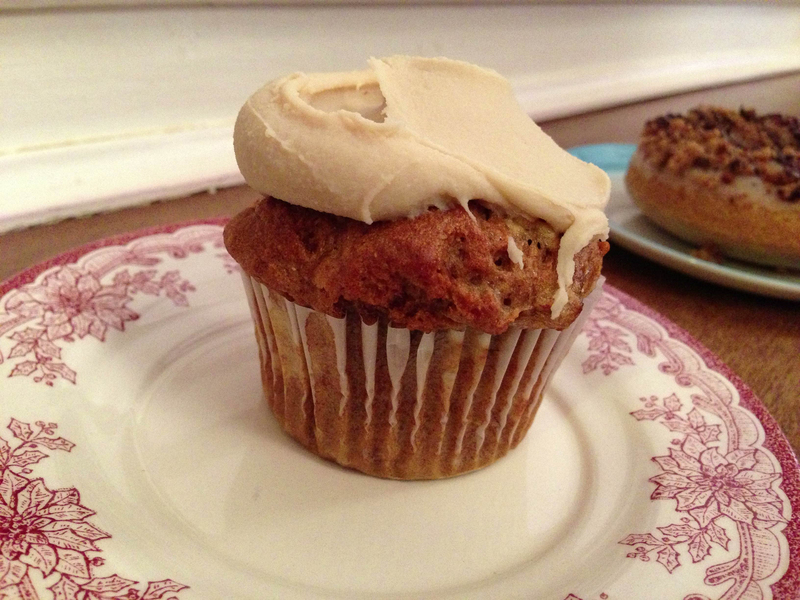 I selected a favorite of mine: a gluten-free banana cupcake. It was frosted with a subtle maple-inflected icing that nicely complemented the dense banana cake underneath it. BabyCakes refrigerates their cupcakes at, what seems to be, a moderate temperature, so the cake actually tastes cool and more firm than it would were it left standing on the counter. We noticed you could order a frosting shot for $1.50 and I considered it for a moment, so good was the maple topping. 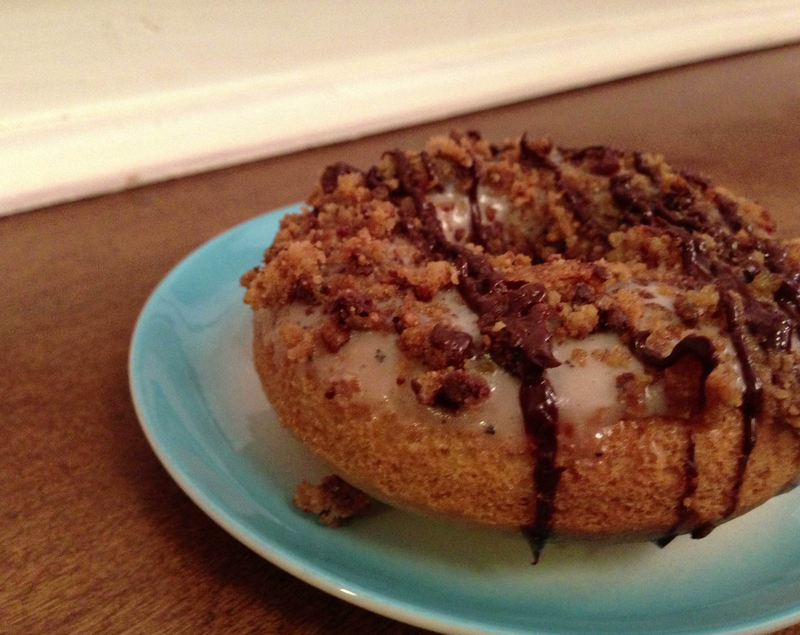 MDP decided to try one of BabyCakes’ doughnuts. He ordered the cookie crunch option, which is gluten-free and made with vegan sugar. It tasted lemony and had a surprisingly nice consistency–much better than anything you might find at cringeworthy Dunkin’ Donuts. BabyCakes also sells brownies, biscuits, an array of cupcakes (some made with spelt), tea cakes, crumb cakes, pies and cookies. And the staff are incredibly accommodating and knowledgable about the ins and outs of their product. One patron came in with her daughter, who sounded like she had celiac disease, and asked a ton of questions about the ingredients of the various items. Erin, the founder, was on site (which is kind of incredible since she’s pretty famous as far as bakery proprietors go) and was happy to provide useful, intelligent responses. Try BabyCakes, no matter what your dietary needs are. Take the F/J/M/Z to Essex-Delancey or the B/D to Grand Street.